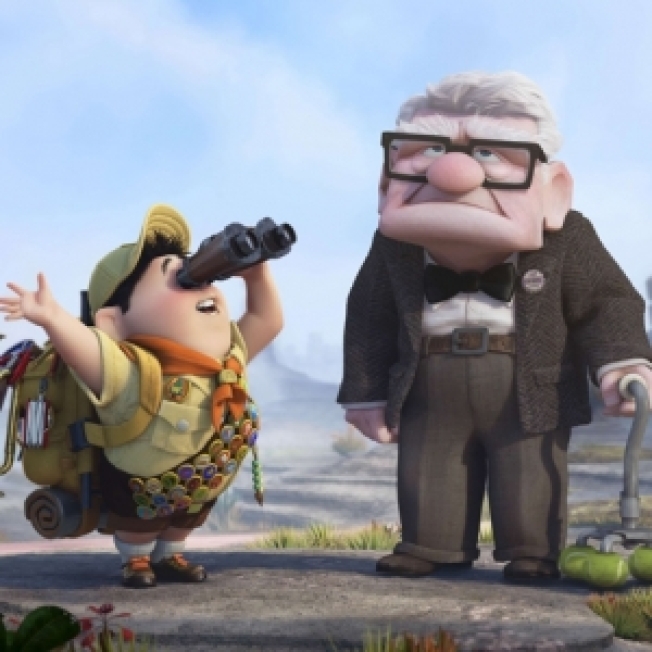 Two live-action comedies were unable to bring down the animated adventure "Up." Disney and Pixar Animation's "Up" reeled in $44.2 million to remain on top of the box office for the second weekend in a row, according to studio estimates Sunday. The Warner Bros. bachelor-bash comedy "The Hangover" came in a close second with a $43.3 million debut. Will Ferrell's action comedy for Universal, "Land of the Lost," had to settle for a distant third with a $19.5 million opening. "Up" was the first movie of Hollywood's busy summer season to take the No. 1 spot for two straight weekends. But overall revenues fell for the second weekend in a row, putting the brakes on what has been shaping up as a record revenue year for the movie business. The top 12 movies took in $164 million, down 6 percent from the same weekend last year, when "Kung Fu Panda" opened on top with $60.2 million, according to box-office figures compiled by Hollywood.com. For the year, Hollywood has taken in $4.3 billion, up 12.5 percent from 2008 revenues. But studios have been unable to maintain the red-hot pace of the year's first four months. "Definitely, things have slowed," said Paul Dergarabedian, box-office analyst for Hollywood.com. "But there are some potential saviors on the horizon." Three big sequels — "Transformers: Revenge of the Fallen," ''Ice Age: Dawn of the Dinosaurs" and "Harry Potter and the Half-Blood Prince" — open within three weeks of one another starting June 24. With $137.3 million in the bank after just 10 days, "Up" is streaking toward the $200 million mark achieved by such previous Pixar hits as "WALL-E," ''Ratatouille," ''Cars" and "Toy Story 2." Revenues for most big movies typically drop 50 percent or more in the second weekend, but the audience for "Up" was down only 35 percent from its opening. That puts it in line with "Finding Nemo," the top-grossing Disney-Pixar animated tale, said Chuck Viane, head of distribution for Disney. "Up" likely will finish in the top three among Pixar flicks, Viane said. Leading the Pixar slate now are "Finding Nemo" with $339.7 million, "The Incredibles" with $261.4 million and "Monsters, Inc." with $255.8 million. "The Hangover" features Bradley Cooper, Ed Helms and Zach Galifianakis as pals on a wild Las Vegas bachelor party, during which they misplace the groom (Justin Bartha) and run into all manner of misadventures. Warner Bros. had expected "The Hangover" to finish at No. 3 behind "Up" and "Land of the Lost." But the movie found a broad audience split almost evenly between men and women and those over and under 25, said Dan Fellman, Warner head of distribution. "Sunday's always good for a hangover," Fellman said. "The Hangover" was directed by Todd Phillips, whose 2003 comedy "Old School" featured a breakout role for Ferrell. Yet Ferrell had one of his weaker openings with "Land of the Lost," inspired by the 1970s children's TV show about adventurers hurled back to an age of dinosaurs. Ferrell's new twist generally was trashed by critics as a crude update. In narrower release, Fox Searchlight's romantic comedy "My Life in Ruins" had a so-so debut of $3.2 million, coming in at No. 9. The movie stars Nia Vardalos ("My Big Fat Greek Wedding") as a discontented tour guide in Greece who unexpectedly finds love. Focus Features' road-trip romp "Away We Go" had a strong opening in limited release, pulling in $143,260 in four theaters for a healthy average of $35,815 a cinema. That compares to an average of $11,588 in 3,818 theaters for "Up," $13,238 in 3,269 cinemas for "The Hangover," $5,545 in 3,521 locations for "Land of the Lost" and $2,771 in 1,164 theaters for "My Life in Ruins." "Away We Go," starring John Krasinski and Maya Rudolph as a couple searching out the best place in North America to raise a family, was directed by Sam Mendes ("American Beauty"). The film expands to more theaters Friday. 2. "The Hangover," $43.3 million. 3. "Land of the Lost," $19.5 million. 4. "Night at the Museum: Battle of the Smithsonian," $14.7 million. 5. "Star Trek," $8.4 million. 6. "Terminator Salvation," $8.2 million. 7. "Drag Me to Hell," $7.3 million. 8. "Angels & Demons," $6.5 million. 9. "My Life in Ruins," $3.2 million. 10. "Dance Flick," $2 million.